Product prices and availability are accurate as of 2019-04-23 23:44:54 UTC and are subject to change. Any price and availability information displayed on http://www.amazon.com/ at the time of purchase will apply to the purchase of this product. 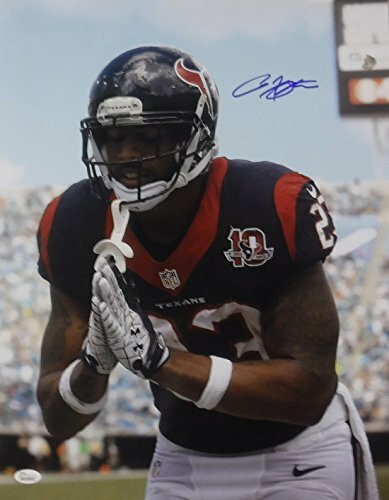 This is a 16x20 photo personally autographed by Arian Foster of the Houston Texans. One of the leagues premier backs, he earned All-Pro and Pro Bowl honors following the 2010 and 2011 seasons. He led the NFL in rushing in 2010 with 1616 yards and added 16 touchdowns. Injuries caused him to miss three games in 2011 but he still rushed for 1224 yards in just 13 games. This after being un-drafted from the University of Tennessee and released by the Texans only to be resigned. This item includes a certificate of authenticity from Denver Autographs and James Spence Authentication (JSA).